James Lafayette Dillard (1858-1943) built the Shelby Hotel in 1913 on 1 West Plant Street in Winter Garden, Florida. In this photograph, it is evident that construction was still in progress. The hotel was located a block away from both the Tavares & Gulf Railroad Company line and the Atlantic Coast Line Railroad (ACL) line. Dillard migrated to Central Florida from Virginia with his wife, Mattie Showalter, in 1887. He established himself primarily as a citrus and vegetable grower, but he also operated the M. V. Dillard and Company Garage, which was managed by his son, Marvin Dillard. In addition, he founded the Bank of Winter Garden, served as Wnter garden City Commissioner and a Florida State Legislator, and helped rebuild Downtown Winter Garden after two destructive fires in 1909 and 1912. Some of the buildings that Dillard helped construct include the Dillard and Boyd General Merchandise Store, the Shelby Hotel, and the Mann and Mills Dry Goods Store. He also donated land to the First Baptist Church of Winter Garden. 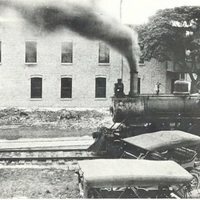 Original black and white photograph: Up From the Ashes Exhibit, Winter Garden Heritage Foundation, Winter Garden, Florida. Up From the Ashes Exhibit, Winter Garden Heritage Foundation, Winter Garden, Florida. Up From the Ashes Collection, Winter Garden Heritage Foundation Collection, Winter Garden Collection, RICHES of Central Florida. “Construction of the Shelby Hotel.” RICHES of Central Florida accessed April 26, 2019, https://richesmi.cah.ucf.edu/omeka/items/show/4649.